A while back I was teaching a class when, out of nowhere, the token fluent English speaker in the class asked me “Teacher, what is a cliché?” It caught me off guard. The idea of a cliché is totally absent in Asian culture so of course he wouldn’t have known. But how do I explain this using only small words and no expressions or idioms? Here’s what I came up with: “umm…. a cliché is something that was good, in the past, but it has been done so many times now that all the goodness has been used up…” Then I thought “actually wtf, that is so cynical of us.” It was a small epiphany for me. This is my roundabout way of saying that clichés aren’t all bad. 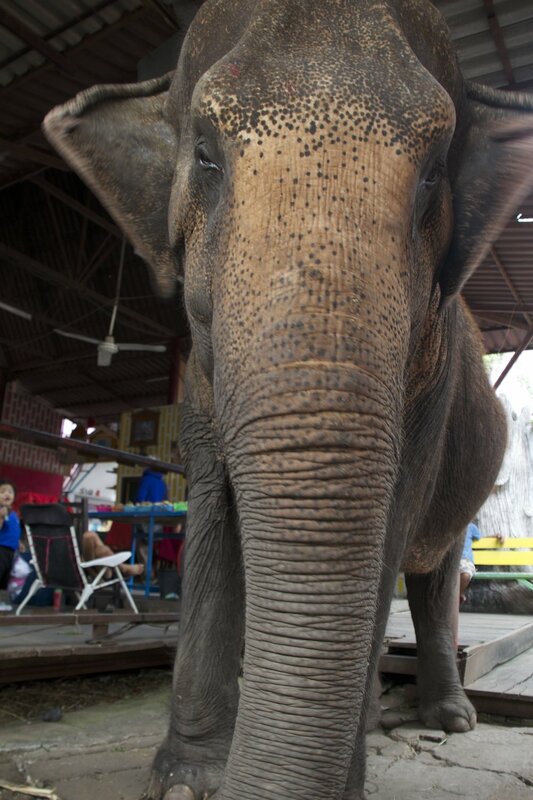 And if ever there was a cliché in travel culture, in Southeast Asia at least, elephants in Thailand take the cake. It’s everybody’s best Facebook profile picture. Does this sound jaded of me? Well keep reading. When I first arrived in Asia I figured that it might be fun to ride an elephant at some point. Like, why not? When in Rome, right? However, it wasn’t long before, in a bar one night, a social justice warrior angrily informed me of the cruelty these animals are subjected to in Thailand. It turns out that elephant tourism in Thailand is known to be one of the more socially irresponsible things you can partake in whilst you are there. 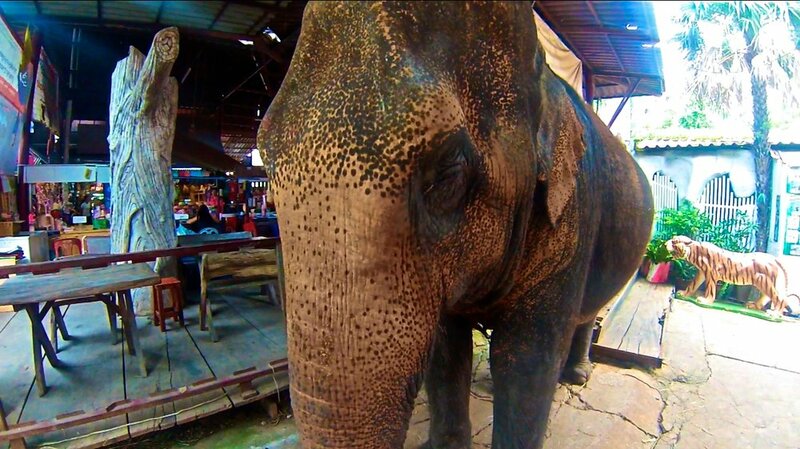 There was a documentary that came out semi-recently called “An Elephant Never Forgets” detailing the abuse endured by elephants in places like Chiang Mai. (You can watch that documentary HERE). 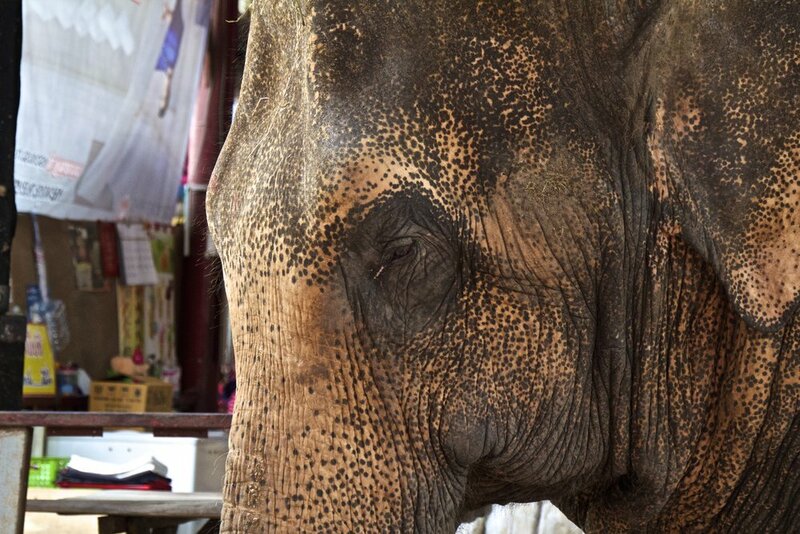 When my hosts suggested that I visit the elephants in Ayutthaya, I had some serious reservations about it. 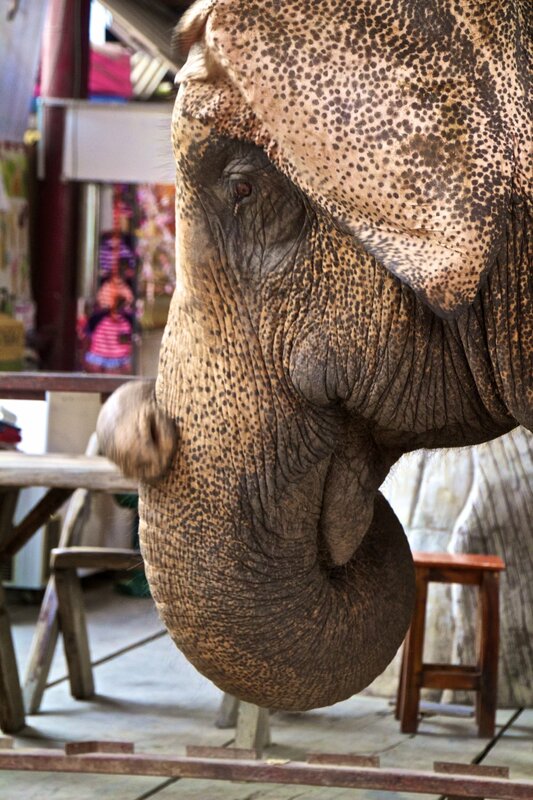 I expressed my concerns to them and they reassured me that while elephants might be treated poorly elsewhere in Thailand, the elephants in Ayutthaya are treated well. Being locals, it was safe to assume they knew what they were talking about. After all, there is a spectrum. It's not ALL terrible. But either way, wouldn't feel very entitled to an opinion on it if I didn't go see for myself. So I resolved to approach the experience with skepticism. We were dropped off at a place called Kwan Chang Ayutthaya. When the people working the ticket counter saw my white skin they tried to charge us double. My hosts shushed me while they haggled and argued the price down to something more reasonable in Thai. I shakily put my foot on the elephants back and plopped myself down in the small bench that was mounted on its back. A little umbrella teetered over our heads. A man in bright red Thai garb was sitting in front of us, perched on the elephant’s shoulders. He gave the elephant a small tap and the great beast lumbered forward. Sitting on our little bench we rocked precariously back and forth as the elephant’s shoulders shifted from side to side with each step. I actually thought that I was going be seasick in the beginning. I was already starting to regret springing for the full hour. The elephant was merging onto a busy, paved street within a minute or so, which wasn’t exactly where I pictured us going. Cars and motorbikes sped by all around us. I looked down at the traffic passing. Nearly every car that passed us by had an arm protruding from the window with a phone to take a picture of us. Meanwhile I white knuckled my seat, contemplating what it would look like for a car and an elephant collided. Like, that must have happened at some point before. We, the passengers, would definitely end up in the hospital. Things got better once we got off the road though. Eventually we found ourselves on dirt roads passing by huge brick temples like the ones we had seen in the other sites around Ayutthaya. It wasn’t long before we lumbered off of the road and into an overgrown field. The elephant stopped to graze frequently. Our guide, still perched on the elephant’s shoulders, grunted and tugged at elephant’s ears as if pleading with it to wait until after the ride was over to eat. Out in the field the man hopped off the elephant to lighten the load and walked besides us. I asked my host and co-passenger if it would be okay for me to sit where our guide had been perched. She asked for me. The man’s response was gruff. My host told me that, based on his almost indecipherable accent, he was from the North of Thailand. He responded that it would be okay for me to sit forward on the elephant but my host was not allowed. Why? I’m going to guess that it was an issue of gender. From everything she had told me so far, Thailand has some serious issues with the way women are treated. I felt pretty unsure about what I was doing but I inched forward and lowered myself feet down behind the elephant’s ears. I rode the elephant for a little ways and it was far less nausea inducing. I gave him a few pats on the head and he raised his trunk up for me to cop a feel. Then it was time for me to retreat to my previous seat, which was easier said than done. Getting myself back up there was an awkward procedure but I made it. When we got back to our point of departure we hopped back onto the wooden structure we had started from. I held out a tip for our guide and the elephant snatched up my money with its trunk, handing the cash backwards. I wasn’t quite done though. Supposedly there was a tiger somewhere on the property. I went into the tiger chamber and sure enough, there it lay. I don’t think I’ve ever been so close to one of the “big cats.” It was big. It lay there lazily as I dragged my fingers through its soft fur. Apparently it was of paramount importance that I be sitting behind it because when I tried to stick my GoPro in front of it they scolded me, telling me in (translated) Thai that if the tiger sees my arm up there it would try to play. You’ve seen a house cat play with dangling keys right? I guess doing that with a tiger is considered pretty dangerous. Then they told me that I needed to leave because the tiger was opening its eyes. I was ushered out of the chamber quickly, feeling slightly gypped. It wasn’t exactly the union between man and beast that I had envisioned but I guess it was still cool. Did I notice any red flags for abuse occurring against these elephants? Much of this abuse supposedly takes place during the infancy of the elephant. Since I wasn't there, I can’t really comment on it. The only elephants I saw were fully-grown. However, I will say this: wild elephants do not allow humans to ride them. In order for this to happen the elephant must first be broken like a horse. The process is supposedly really violent – brutal even. 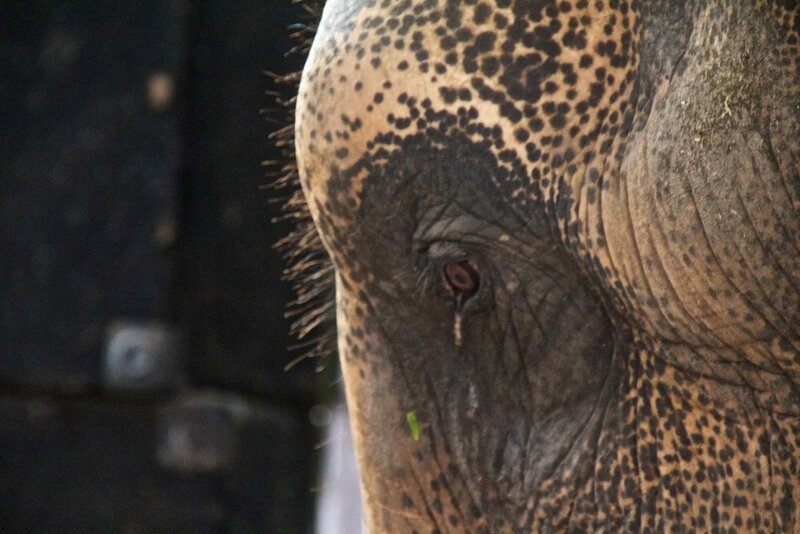 It is called Phajaan or “the crush.” It is essentially torture of baby elephants. Seeing as I rode an elephant, the logical implication would be that it went through some form of “the crush” at some point. They say that an elephant never forgets. 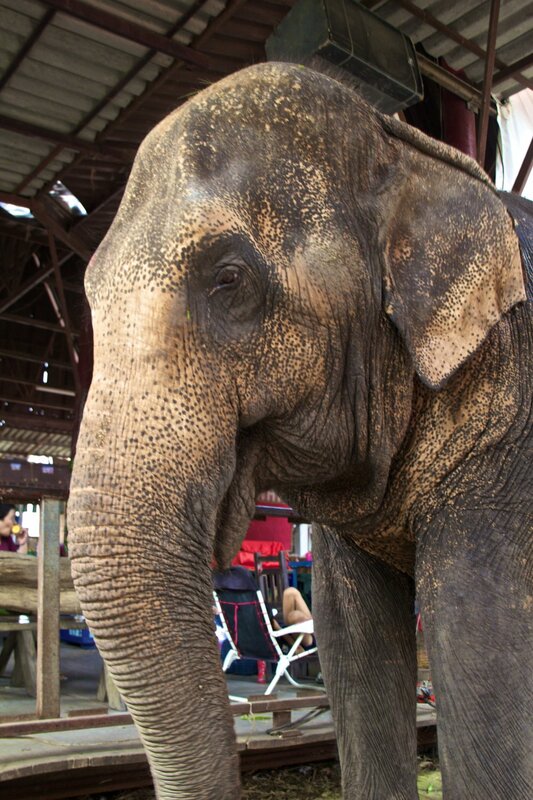 But putting aside their childhood baggage, were the elephants at Kwan Chang treated with kindness? I am led to understand that the most common forms of elephant abuse come in the form of (1) malnourishment, (2) over work, and (3) exposure to the hot sun. Malnourishment: these elephants seemed to have plenty of food and water, and their handlers kindly allowed them to graze on the job. I'd say that rules out malnourishment. Overwork: During my visit, there were probably 12 to 15 elephants sitting in the shade of their shelter, resting. Maybe it was just a slow day, but based on what I saw, I can't say that any of the elephants seemed to be in danger of being overworked. Exposure: In the wild, elephants will cover their backs with mud to avoid sunburns. They are, however, prevented from doing this in many Thai establishments. This gives way to painful burns. In our case, the elephants had large cloths draped over the whole of their backs, and a large sheltered area to rest. So I guess that takes care of that issue. Overall the place seemed okay. Obviously a life of indentured servitude and novelty isn’t ideal, even for an animal, but after some research, my experience would suggest that Kwan Chang was on the more positive end of the spectrum, granted it’s not a great spectrum to be on in the first place. I'm not sure if I would do it again, but I'm glad I did it the one time. I wouldn’t have had much of a perspective to talk to you from in the first place if I didn't have any first hand experience. You can make your own choices if you ever travel to Thailand. It will always be hard to tell exactly what you are helping to fund if you choose to ride an elephant, but I think it’s worth doing once so long as you approach the experience with as much skepticism as you can. 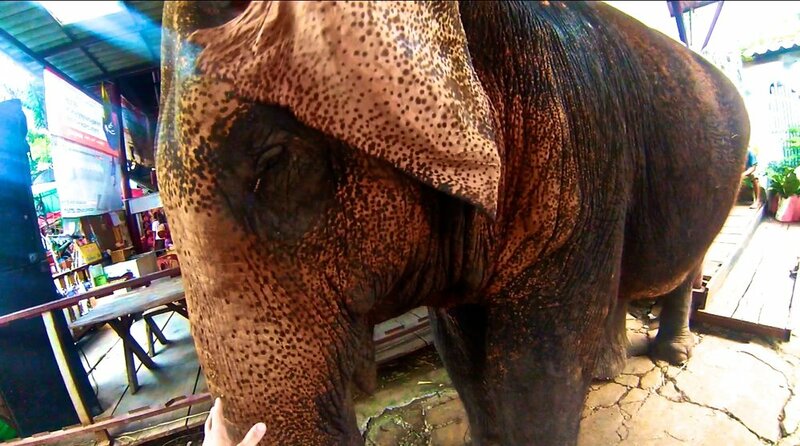 In my brief experience, the elephants I encountered seemed to be treated kindly, but who really knows? One thing was for sure though: they're beautiful creatures, with a surprising amount of personality. They were like giant puppy dogs.